The Hofburg ("Court Castle") was the Imperial Palace for the Habsburgs for several centuries, although the current building that is bearing the name Hofburg was largely built in the 19th century and developed piece by piece. There are two qualities to the Hofburg: Its utterly strange layout with no natural centre with the clear notion that it was re-modelled repeatedly; and the gigantism of the architecture, making it the climax of both the Ringstraße buildings and the madness of Austrian Imperialism. A short peek at the Michaelertrakt Wing by the Michaelerplatz Square. However, the palace started small: The oldest parts date back to the 13th century, the previous palace was on the "Am Hof" square near the Schottenstift Monastery, though. The oldest foundations pre-date the Habsburg dynasty and were probably laid by the late Babenberg dukes or King Ottokar Premysl of Bohemia. Between 1483 and 1583 and then again from 1612 to 1806, it was the palace and residence of the Emperors of the Holy Roman Empire. After that, it was the palace of the Emperors of Austria and later Austria-Hungary until 1918. 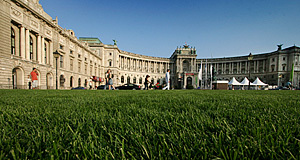 The sheer size of the building allows multiple uses: It is the official seat of the President of Austria, a conference centre, houses several museums, allows visitors to some of the state apartments, and provides office space for the OSCE alongside with other international organisations, several souvenir shops and the Vienna Boys′ Choir (Wiener Sängerknaben). Oh, and there′s two parks, the Austrian National Library, a few squares and statues, the Albertina Graphic Art collection, ball rooms, a massive greenhouse, the treasury with a the crown jewels of a fair share of European nations, a couple of fountains, the Augustinerkirche Church and the Spanish Riding School. Immersing yourself in the Hofburg in all its magnitude, you might be surprised to find out that the plans for the last extension actually aimed to make the whole thing about twice as big as it is and transform in into a so-called "Kaiserforum" (Imperial Forum). Thanks to the spending habits of the Habsburgs on this palace, I′ll have to split this article into several pieces. Let′s start with the most touristy one, the Kaiserappartements.